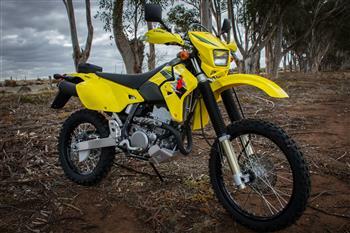 Suzuki is pleased to announce the imminent arrival of the next generation of Australia's favourite trail bike. One of Australia's best-selling off-road motorcycles in 2009, the Suzuki DR-Z400E trail bike is now even better value, with a $400 CashBack until the end of February. Australia's best-selling off-road motorcycle in the first quarter of 2009, Suzuki's DR-Z400E trail bike is now even better value, with a $400\* cash back offer until the end of June. Suzuki has announced a generous $400\* cashback offer on the ever-popular DR-Z400E and DR-Z250, including the recently-released 2009 models, giving new riders of the trail bikes even more bang for their buck until the end of February. Two of Australia's most-popular trail/enduro bikes, Suzuki's 2009 models of the value-packed DR-Z400E and DR-Z250 are now available down under. Suzuki's ever-popular DR-Z400E and DR-Z250 trail bikes are now even better value, thanks to a generous $400\* cashback offer valid until 31 October.